Today I needed to wear a suit for some meetings at work. After getting changed, ready to ride my bakfiets down to the other end of campus for my meeting. Photo credit: Corey Wallis. Before I got the bakfiets, this would mean either giving up riding to work for the day, or going into work on the weekend by car to drop my suit off, and then another visit to pick it up again later. Now I can just hang my suit back in the weather canopy, and get changed into my nice uncrumpled suit at work. 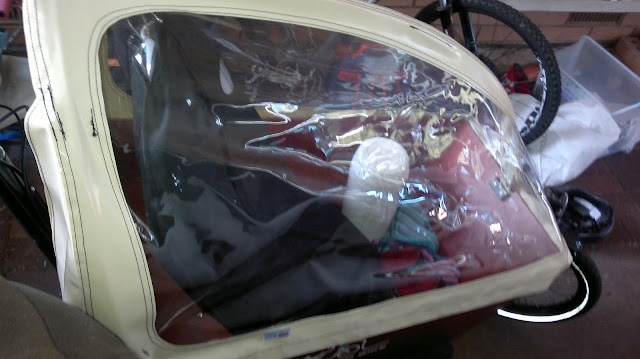 Here is my suitbag (and porridge maker) in the bakfiets ready for departure this morning. 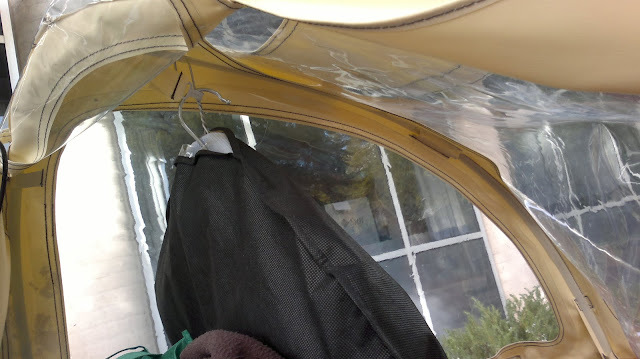 There is a little trick to it, so that the suit back hangs from the top of the canopy, instead of sliding down and perhaps getting a bit crumpled. Use the rear window catch on the canopy to hold the hanger near the top. Hook hanger over fibreglass rib, and then hook it with the little catch used to keep the back window rolled up when open, so that the hanger doesn't slide all the way down the rib. The suit made it nicely. I planned to walk from my lab down to the meeting, but time got away from me, so I rode the bakfiets down to the other end of campus (about 1.5km and a vertical drop of about 100m) wearing my suit. I did remember to take my full-face helmet off before walking into the meeting. I packed the suit bag and my civvies in the bakfiets so that I wouldn't have to ride back up the hills in my suit. There is a saying that if you are sweating while riding a bakfiets, you are going too fast. However, when the route consists of an average grade of almost 7%, and several short sections that are much steeper, you just about need to be riding backwards to avoid sweating.